The capability for biosensing, biomedical imaging, and biomolecular manipulation has become essential in current biomedical research and development. Light is very attractive in that it can be utilized for all these functions. Biophotonics is the study of light interaction with biological matter and it is also recently regarded as the key science for the next generation of clinical tools and biomedical research instruments. This research area, however, is still in need for advanced biomedical imaging techniques, highly sensitive biophotonic sensors, and massive/rapid biomolecular manipulation methods. For last decade, a remarkable achievement in nano/ microscale manufacturing of engineering materials has been rapidly stimulated by MEMS and NEMS (Micro/Nano Electro-Mechanical systems) technology and moreover high sensitive metrological techniques at micro/nanoscale lead physiologists to deeper understanding on the working mechanism of physiological structures in nature. 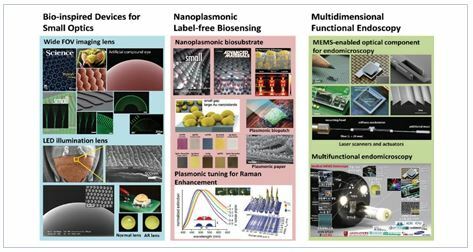 KAIST Biophotonics laboratory is currently developing next generation functional endoscopy incorporated with biomimetic photonics and bionanoplasmonics. techniques also enable the detection of small molecules at pico molar level by incorporating nanofluidics and nanopores. Nanophotonic and Microphotonic techniques are currently being empolyed for functional endoscopy based on optical coherence tomography (OCT) and Terahertz time-domain spectroscopy. CMOS image sensor array mimicking human retina with spherical configuration to minimize optical aberrations. Especially, insect’s compound eyes have been of my most concern among natural optical schemes, because their optical schemes are completely different from others. They have many advantages capable of wide field-of-view detection, polarization detection, spectral sensitivity, and fast motion detection in miniaturized imaging system. Our approach on the demonstration of biomimetic microfabricated compound eyes for omni-directional detection can also be a suitable example for the development of biomimetic advanced photonic devices. The omni-directional optical sensing of insects in a small form factor is one of the most important needs for their survival. Their functionality is achieved by spherically arranging ommatidia that collect impinging light within small angle (‹4°). Each ommatidium consists of a light refracting facet lens, a light-guiding crystal cone and rhabdomere, and photoreceptors. The engineering duplication of the unique 3D structure has been demonstrated by utilizing polymer microlens and a nonlinear UV lithographic process called a self-written waveguide process in a photosensitive polymer resin. This work gives a new paradigm for developing wide field-of-view detection or motion detection in surveillance detectors, mini-robots, and miniaturized imaging systems such as digital cameras or mobile phones. catheter of few millimeters. Scanning MEMS mirrors, lens scanners, or fiber scanners can be utilized as a fast scanning device. Our approach is focused on the development of MEMS mirrors and lens scanners for OCT based endoscopic catheter that requires the parallel consideration from design to packaging due to spatially restriction. 1. K. H. Jeong, J. Kim, and L. P. Lee, “Biologically inspired artificial compound eyes,” Science, vol. 312, pp. 557-561, 2006. 2. Y. J. Oh, S. G. Park, M. H. Kang, J. H. Choi, Y. Nam, and K. H. Jeong, “Beyond the SERS: Raman enhancement of small molecules using nanofluidic channels with localized surface plasmon resonance,” Small, vol. 7, pp. 184-188, 2011, featured as a Cover article. 3. H. C. Park, C. Song, M. Kang, Y. Jeong, and K. H. Jeong, “Forward imaging OCT endoscopic catheter based on MEMS lens scanning “, Optics Letters, vol. 37, pp. 2673-2675, 2012. 4. J. J. Kim, Y. Lee, H. G. Kim, K. J. Choi, H. S. Kweon, S. Park, and Ki-Hun Jeong, “Biologically inspired LED lens from cuticular nanostructures of firefly lantern”, Proceedings of the National Academy of Sciences of the United States of America, vol. 109, pp. 18674-18678, 2012. 5. M. Kang, J. J. Kim, Y. J. Oh, S. G. Park, and K. H. Jeong, “Deformable nanoplasmonic membrane reveals universal correlations between plasmon resonance and surface enhanced Raman Scattering”, Advanced Materials, vol. 26, pp. 4510-4514, 2014. 6. 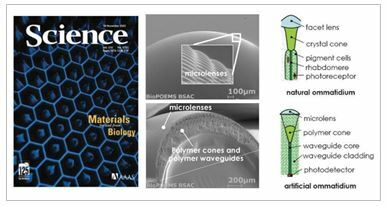 Y. J. Oh, J. J. Kim, and K. H. Jeong, “Biologically Inspired biophotonic Surfaces with Self-Antireflection”, Small, vol.10, pp. 2558-2563, 2014.